Land Change Modeler is now an extension for ArcGIS software. GIS contributes to the accuracy of mapping the potential of land-cover classes. Software provides a means to combat threats, such as economic development. Due in part to a tremendous amount of economic growth in recent decades, the Bolivian lowlands saw forest loss of almost 3 million hectares between the years of 1992 and 2004, with almost half of this loss coming between 2001 and 2004 alone. This land change is expected to be the major contributor to biodiversity loss (even more important than climate change) and contributes to habitat degradation, fragmentation, and destruction. Indeed, the rate of deforestation is second only to that of Brazil. With forests dominating more than 65 percent of the land cover in lowland Bolivia, it is essential that this land-change dynamic be appropriately analyzed, particularly as we now know tropical forests are a critical component for maintaining climate system function and that they also represent the habitat for a wide range of species. 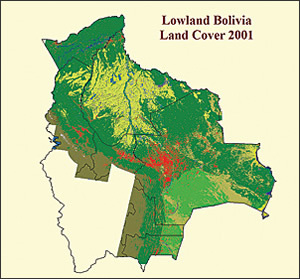 These land-cover maps depict dramatic lowland deforestation (red) over time between 1992, 2001, and 2004 (data: the Geography Department at Bolivia's Noel Kempff Mercado Natural History Museum). Conservation International, based in Arlington, Virginia, is an organization at the forefront of preserving natural systems in a sustainable manner. It has focused much attention on land-cover change in the Amazon, particularly in Bolivia, and it has relied more in recent years on the scientific application of GIS for insights into managing habitat loss and predicting future scenarios of change. To better implement this effort, Conservation International has prioritized the oversight of the development of essential integrated tools for identifying hot spots and conserving habitat and biodiversitytools to better manage, monitor, and prioritize the risks to the environment associated with economic development. Clark Labs (an Esri Business Partner located in Worcester, Massachusetts, and based within the Graduate School of Geography at Clark University) partnered with Conservation International over several years to develop a land-change modeling software environment to analyze land-cover change and assess the potential impacts of these scenarios on biodiversity. The result of this collaboration was the development of the Land Change Modeler (LCM), implemented within Clark's IDRISI GIS and image processing software and recently as an extension for ArcGIS software. For a recent showcasing of LCM, Clark used land-cover maps depicting dramatic deforestation over time that were developed by the Geography Department at Bolivia's Noel Kempff Mercado Natural History Museum for that nation's lowlands. These maps showed forest change that occurred between 1992 and 2001. A set of 28 static and dynamic driver variables that may have impacted this change, such as proximity to infrastructure, slope, and soil type, were also included. Information on known road improvements for Bolivia as part of the planned intervention input to the prediction phase further refined the model. For this project, a multilayer perceptron neural network was used to create a predictive model, relating the observation of deforestation with the driver variables. Clark chose this method because of its high accuracy for mapping the transition potential of land-cover classes. To assess the quality of the model, a prediction was made to 2004 and the output was validated against known conditions in 2004. A species richness map was developed, then combined with the 2015 soft prediction to derive a risk of biodiversity, or endemic loss. Once the model was calibrated, additional future scenarios were then produced. One such scenario included both a soft and hard prediction of land change in the Bolivian Lowlands for the year 2015. 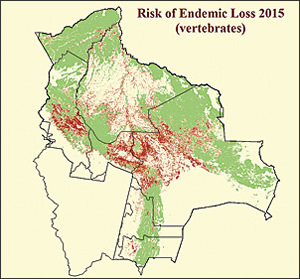 The hard prediction yielded one possible scenario of the locations of change, while the soft prediction gave an indication of the deforestation vulnerability in 2015. Results from this scenario were then combined with biodiversity data to uncover the potential impact on biodiversity. Using collections of species range polygons, initially supplied by NatureServe and subsequently recalibrated in Land Change Modeler for ArcGIS, a species richness map was developed for all birds, mammals, and amphibians. A total of 73 species endemic to Bolivia were identified, including 36 amphibians, 16 mammals, and 21 birds. This map was combined with the 2015 soft prediction (deforestation vulnerability map) to derive a risk of biodiversity, or endemic loss. The results are alarming. Assuming business as usual, the potential forest loss could be devastating to biodiversity in Bolivia. For example, one of the endemic species, the masked antpitta (Hylopezus auricularis), an already threatened species, is projected to lose one-third of its habitat by 2015. Indeed, for the base time period of this study, 20012004, 4 percent of the current endemic mammal habitat has already been lost. The implications of land change on biodiversity are occurring now. Land Change Modeler for ArcGIS provides a means to combat threats, such as economic development, and to assist those engaged in important conservation practices to prioritize threatened environments. Clark Labs, in conjunction with Conservation International, is currently conducting training in the use of these important tools for land-use planning and sustainable development in countries undergoing high biodiversity loss to further prioritize their planning interventions. James Toledano is executive director of Clark Labs, Clark University. Ron Eastman is the director and founder of Clark Labs. Florencia Sangermano is a research associate at Clark Labs. Tim Killeen is a senior research scientist at the Center for Applied Biodiversity Science, Conservation International. For more information on Conservation International, visit www.conservation.org. For more information on Land Change Modeler for ArcGIS, contact Clark Labs (Web: www.clarklabs.org, e-mail: clarklabs@clarku.edu). Noel Kempff Mercado Natural History Museum is a recipient of GIS software from Esri's conservation programs and has received additional support from the Bolivian government, Conservation International, The Nature Conservancy, and the World Wildlife Fund.